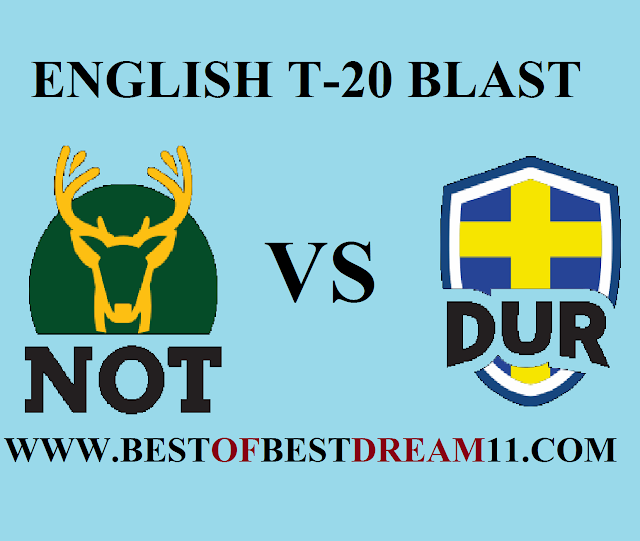 Welcome to our " BEST OF BEST DREAM 11 " FOR" NOT VS DUR" Match.North Group,T-20 Blast 2018. Here is best " NOT VS DUR " match,North group, dream 11 team for the fantasy user who are looking to make a strong team for maximum win.We are providing latest news ,match update,information about the match.The team is picked by using various factor on the basis of performance .ground stats and latest form. 1- Durham Jets has 2 win and 2 losses in 4 matches so far. 2- for Durham , Tom Latham,Paul Kolingwood and Graham Clark will be the key batsman, While James Winchell and Will smith will be the key bowler. 3-Delighted with the 39 run win under D/L method against Derby-shire,NOT outlaws when they faced DURHAM JETS . 4- NOT has 3 win in 4 matches. 5-Daniel Christian is good form, make 225 run in just 4 matches. Nottinghamshire have named 13 member squad to face Durham with one changes Rikki wessel rejoin the squad in place of Paul Calpfin.